SweetIM for Messenger has been delisted from Canadian Content. This can be for a number of reasons, but most likely it failed to meet our guidelines for safe downloading due to user feedback and automated tests and virus scans. SweetIM for Messenger was a I. Version 3.6.0.3 is a freeware program which does not have restrictions and it's free so it doesn't cost anything. 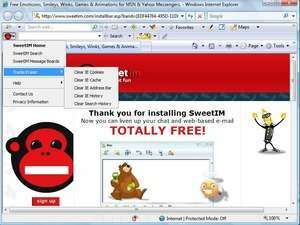 For security reasons, you should also check out the SweetIM for Messenger download at LO4D.com which includes virus and malware tests. Additional screenshots of this application download may be available, too. 1.5 out of 5 based on 19 ratings. SweetIM for Messenger has a presence on social networks.